When LifeVantage introduced AXIO, it was an immediate hit. LifeVantage has introduced another winner: AXIO Decaf. Decaf fans understand the nuances of stimulants. While caffeine jolts you to attention, natural stimulants provide smooth, sustained energy. When you need brain energy but don’t want the added caffeine, try AXIO Decaf. It comes with the same long-lasting, brain-boosting formula as the original AXIO. Ready to order AXIO Decaf? AXIO Decaf ingredients provide long-lasting power, enhanced concentration, and improved focus without the jitters. AXIO Decaf’s blend of ingredients includes vitamins, minerals, and phytonutrients. It supports energy metabolism and mental clarity. The individuals who use AXIO Decaf report enhanced concentration and sharper focus. AXIO Decaf is an instant energizer but also has long-term benefits. It tempers the body’s response to stress. Like the original, AXIO Decaf is sold as a powder which dissolves in water. A clean, low-calorie, low-carb, vegan formula that is BSCG approved and free of artificial colors, artificial flavors, and artificial sweeteners. Plus no added sugars, GMOs, and gluten. LifeVantage Nutrigenomic products support the natural cellular processes. When these processes break down, the body ages more quickly. Nutrigenomics is the science of slowing (or stopping) cellular aging by boosting the cells’ ability to function correctly. The logical thing is to help your cells generate their own antioxidants. This is Adam Green, and I am a LifeVantage Independent Distributor in Farmington. 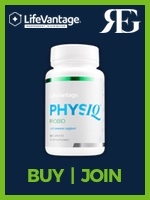 I sell LifeVantage PhysIQ Essentials Fat Burn, ProBio and Protein Shake. My favorite products include LifeVantage Omega Oil. The content on this website is provided for informational purposes. It is not to be a a substitute for appropriate medical advice or care. You should not use this information to diagnose or treat any health concerns or illnesses without discussing it with your physician.